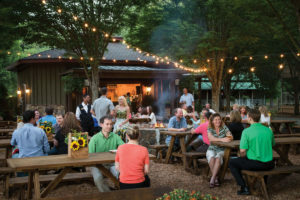 Experience the beauty, adventure, and romantic history of this splendid Georgia destination. A mere two-hour drive from Birmingham, Barnsley Resort promised equal parts intrigue, adventure, and downtime for my three-day girlfriends’ getaway. Upon arrival, we settled into our individual cottages along the property’s village green and reconvened for afternoon cocktails at The Woodlands Grill, overlooking a wide swath of the Fazio-designed golf course. The bartender discovered our group was especially fond of good bourbon and assembled a tasting (Weller Special Reserve, Colonel E.H. Taylor Single Barrel, and Weller Antique 107) that proved to be the ideal start for our evening. We then lingered over entrées before splitting a few indulgent desserts. When we returned to our cottages, we found that the fireplace in each two-room retreat had already been lit, perfectly filling each place with warmth on this chilly evening. 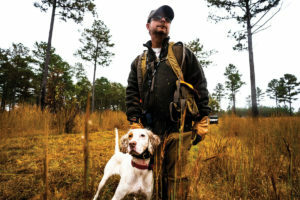 John Burrell, president of the High Adventure Company which operates the Beretta Shooting Grounds, wrangles flusher Lucky on a recent quail hunt. This property is just one of several hunting and fishing locations Burrell and his team run. Early the next morning, our group headed to one of the more recent enhancements to the Barnsley property: the Beretta Shooting Grounds by High Adventure Company, operated by veteran outdoorsman John Burrell. Consisting of a sporting clays course and 3,000 acres of wilderness shooting grounds, the recreational facility has the distinction of being the only one with a Beretta designation. Guests can rent a gun (or buy one like I did! ), get outfitted for the adventure, and enjoy a hunt led by seasoned guides. The entire experience certainly measures up to the highest standards of the Italian firearms manufacturer. Post-quail hunt, we visited the Beer Garden, built as an homage to the Bavarian prince in the resort’s history. Relaxing at hefty picnic tables nestled by numerous firepits proved to be the perfect way to spend an hour or two. The casual Beer Garden offers the perfect spot to while away an early-evening hour or two. Dinnertime took us to the fabled ruins of the Italianate Manor House, a place usually reserved for rehearsal dinners or company retreats. Local historian and preservationist Clent Coker sat fireside with us and shared the intriguing story of the site. According to Clent, shipping magnate Godfrey Barnsley selected this location in the early 1800’s as his family’s retreat from the stifling climate of Savannah, Georgia. Godfrey and his wife, Julia, hoped to raise their brood in the more temperate Georgia foothills. They lived on site for years while planning and beginning construction on the manor house, but Julia died before completion of the home. Local lore says that Godfrey wanted to abandon his plans, but Julia appeared to him in a dream and encouraged him to continue. Though he finished the home, Godfrey and his family experienced financial issues in the post-Civil War years. As a result, the property was left fallow. Clent told us that years later, Bavarian Prince Flugger was introduced to the property and became its new owner. The prince began rehabilitating the place as a labor of love that was then passed on to the Saul family of Dalton, Georgia. 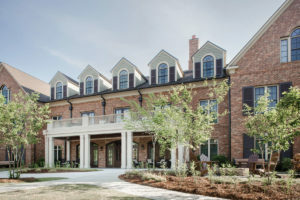 The Sauls can be credited with many of the improvements visible today: a brand-new inn which combines old-world charm with modern amenities, the restoration of the 19th-century Rice House, and the construction of Georgian Hall where weddings and corporate events take place in a first-class setting. The stately inn opened just last spring but dovetails perfectly with the historic architectural vision of Godfrey Barnsley. With stomachs full from a delicious dinner and our heads full of romantic tales of our surroundings, we walked back to our rooms to enjoy a restful night tucked under poofy down comforters. I feel pretty certain I dreamed of Confederate love stories and princes from the Black Forest. Eager to explore more of the property the next day, my girlfriends and I stopped by the Outpost General Store to take advantage of the complimentary bicycles. Our ride took us just beyond the Manor House Ruins, where we found the Barnsley Barnyard. Home to a couple of Jersey cows, a passel of prized Ossabaw pigs, and more than a dozen landscaping herbivores (ahem, goats), the Barnyard is also where we picked up horses for a trail ride. 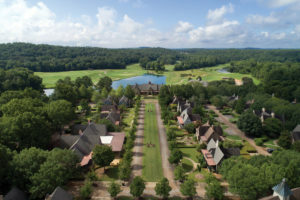 Selecting the route that would take us on the most scenic tour, we crossed paths with golfers at the famed 14th hole with its 120-foot drop and caught anglers practicing their casts at the 10-acre lake. As the sun began to set and we handed over our reins, we realized we were eager for dinner. 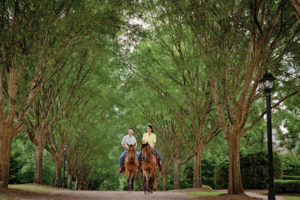 Horseback riding is only one of the many ways to enjoy the beauty of Barnsley Resort. That night at The Rice House Restaurant Chef de Cuisine Evan Babb emerged from the kitchen just as dessert arrived, and we learned he spends his days off at a nearby farm where he plants seedlings to later harvest for Barnsley Resort guests. His passion for foraging is certainly evident, from the warm goat cheese fritters to the chocolate mousse with salted caramel. Three days at Barnsley proved the perfect amount of time to get acquainted with this newfound vacation crush. As my girlfriends and I loaded up our cars, we were already making plans to come back—with our families, with other girlfriends, and for holidays. Barnsley Resort certainly lived up to the ideals that Godfrey himself had dreamed of many years ago. 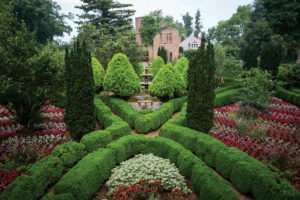 Both the home and its elaborate gardens were inspired by the work of Andrew Jackson Downing, a pioneering landscape designer and proponent of Italianate and Gothic Revival architecture.